Conwy and Denbighshire Fire Protection. Please click on LOGO BELOW and you will be asked to fill in contact form on contact us page,or if could call phone number and quote your code from YELL or from other search engines or other media sources. We install fire alarms • fire extinguishers • fire doors • intruder alarms • CCTV and electric gates. 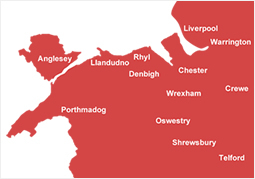 We install and service all your security systems throughout Conwy,Denbighshire and North Wales.